Amy Hogan didn’t grow up saying that she wanted to be a feminist. Contrary to 20th-century feminist Margaret Sanger, the Planned Parenthood founder who sold contraceptive drugs by preaching that they would free women from the so-called drudgery of motherhood and grant them healthier energetic bodies with more free time, Dr. Hogan wants to emancipate women from contraception. Unlike Sanger, 32-year-old Dr. Hogan is happy to be a wife and mother of four, even though she lost one child to miscarriage. After suffering the miscarriage, Hogan knows well the grief associated with losing a child and she wishes to save women from this sorrow, which is often caused by contraception. Hogan believes that the way to change the hearts and minds of those who advocate contraception is to talk. Medical professionals and patients need to be informed about the dangers of contraceptives to women’s health and other perilous effects. Thus, Dr. Hogan recommends that physicians and patients learn about natural family planning. For married couples with legitimate hardships such as serious illness, natural family planning is a more effective way of spacing children and it does nothing to destroy female fertility. 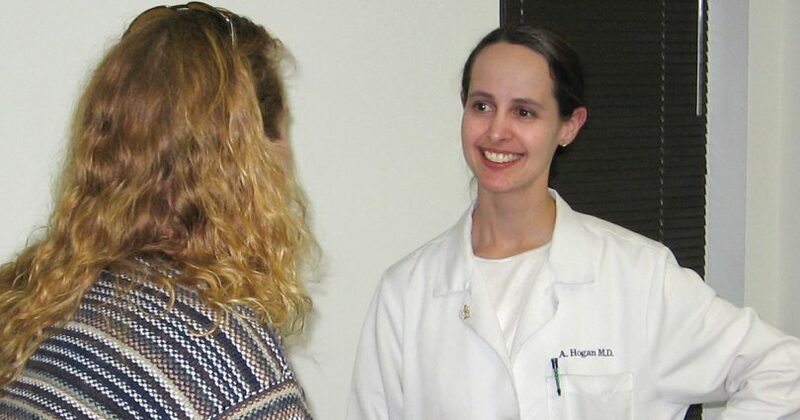 Dr. Hogan first became familiar with contraceptives when she volunteered at a pregnancy counseling center during her early years at Kansas State University. She noticed that clients would be pregnant and say they had used some type of hormonal contraceptive, which apparently didn’t work. Working at the pregnancy center and a Christian camp for girls, Hogan heard her true calling. She said, “I love people and I just knew I was meant to be a doctor.” With a degree in nutrition science, she graduated from K-State in 1999 and in the same month married her college sweetheart, Dan Hogan. Another month later, she entered Kansas University Medical School. “My first day of med school was very difficult. All I wanted to do was go off somewhere quiet and be a mother,” Hogan recalled, noting that she also felt the internal push to go forward with her education. During medical school, she became pregnant with her first son, Matthew, now six. She said most of her classmates thought she was crazy to try and enter both the medical field and motherhood. Yet she persevered through school and is successful in both vocations. Now Hogan lives in Great Bend, Kansas and is a family physician in her home town at St. Joseph Family Medicine, where she refuses to prescribe contraceptives. Her views are similar to the Comstock laws of 1873, since contraceptive drugs and devices violate nature’s laws and morality in addition to damaging health. Dr. Hogan encourages women on contraceptives to read the fine print on the papers enclosed with the drugs. They can cause illnesses, including high blood pressure, blood clots, heart attack, stroke, jaundice and depression. Potential minor side-effects include bloating and headaches. Hogan noted. “In the beginning, when the birth control pill was being tested, women were dying from it. It’s still the same drug. They just changed the dose.” Hogan explains to patients that there are three ways a hormonal contraceptive can work in the female body. First, it may stop ovulation and she emphasizes the “may,” since these drugs often fail. Secondly, hormonal contraceptives may change a woman’s cervical fluid from a water-like substance to a tar-like fluid so the sperm cannot easily swim around and fertilize an egg. The third way contraceptives function is by changing the lining of the uterus so that if the contraceptive fails and fertilization does occur, the tiny child cannot attach to his or her mother’s womb. In such cases, contraceptives abort newly formed human persons. In 1965, teaches Hogan, the American College of Obstetricians and Gynecologists changed the definition of a human person’s real beginning to the point when he or she implants in his or her mother’s womb. That way the college could call hormonal birth control a contraceptive rather than an abortion agent. Hogan said one of her friends in medical school was told that she would get no more than a “C” from her OB/GYN instructor unless she advised women on contraceptive use. “I, fortunately, was able to fly under the radar, so to speak, because I would present my views as what I felt was most healthy for women,” Hogan said of her medical school experience. Heavenly Father, “from Whom every family in heaven and on earth takes its name” (Ephesians 3:15), grant conversion of heart to our world, our society, our families and especially to our own hearts regarding the sin of contraception. We believe, beyond a doubt, what the one, holy Catholic and apostolic Church teaches about this moral evil and we wish to be a light to the nations to make the truth known wherever this evil practice and ideology have taken root. Call us to be faithful to Your command to “Be fruitful and multiply,” so that we may advance the civilization of life and love that You wish to create for the human family. Bring to conversion those who, in public or private, lead others into the sin of contraception and who erroneously teach that it prevents abortion. Help us all to be purified of the lies and distortions of the culture of death by obedience to the truth and bring us all to the fullness of truth through the guidance of Your Church. We ask this through the intercession of the Immaculate Virgin Mary, in whose fertile womb Your Blessed Son found His home on earth. Amen. This is Dr. Hogan’s favorite daily prayer. It was originally published by Human Life International, 4 Family Life Lane, Front Royal, VA 22630 or call 800-549-LIFE. Donetta Robben is a freelance writer from Hays, Kansas.